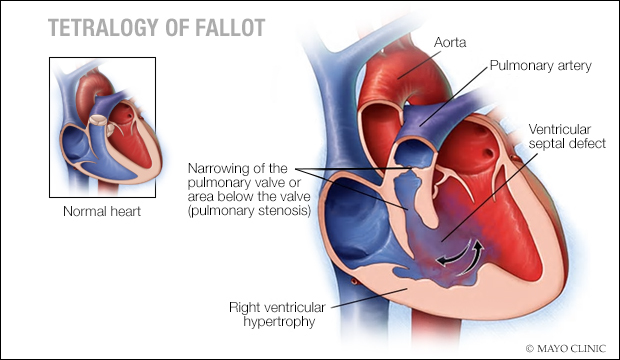 Tetralogy of Fallot is the combination of four congenital heart abnormalities. Presenting at birth, the four defects affect the structure of the heart. The defects include the narrowing of the pulmonary valve (which separates the lower right chamber of the heart from the pulmonary artery), a hole in the ventricular septal wall (the wall that separates the two lower chambers of the heart), an overriding aorta, and the thickening of the muscular wall of the right ventricle (the lower right chamber of the heart). Often diagnosed in infancy, the condition presents itself through symptoms such as bluish skin due to lack of oxygen, shortness of breath and rapid breathing, loss of conciousness, or a heart murmur. TOF is most often corrected by surgery. When diagnosed early enough, and corrected by appropriate surgical treatment, most children and adults who have the defect, are able to live relatively normal lives, but will need medical care throughout life. 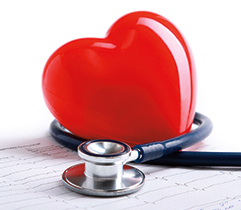 A recent study chronicles how a 32-year old women, years after having surgery to correct tetralogy of Fallot, presented for evaluation of her congenital heart disease. The woman last had surgery when she was three, for a TOF repair after receiving a Blalock-Taussig shunt in early childhood. Upon examination, certain irregularities were discovered. Read the rest of the study to find out what her doctors, including Heidi M. Connolly, MD., decided to do.